January is for a spot of respite, a time to escape from the hustle and bustle of sale shopping and pause for a moment within the walls of the Tate Modern. Robert Rauschenberg (Dec 1 – April 2 2017) is the first retrospective exhibition of the artist’s work since his death in 2008, and celebrates his influential six-decade long career. Best known for his Combines of the 1950’s, Rauschenberg’s works span a variety of mediums, from screenprints to sculptures, to paintings, performances and photography. The eleven rooms are curated chronologically, leading the viewer on a narrative journey throughout his artistic development. The result is a visual social commentary on 20th century America, imbued with a touch of the artist’s trademark humour. From a thousand gallons of bubbling mud (Mud Muse; 1971) to a stuffed goat bound with a tyre (Monogram; 1955-59), the pieces on display will delight and intrigue in equal measure. Other highlights include My Bed (1955), and Pelican (1963), a performance with dancer Carolyn Brown. With five star reviews from The Times and The Guardian, it’s one not to be missed. 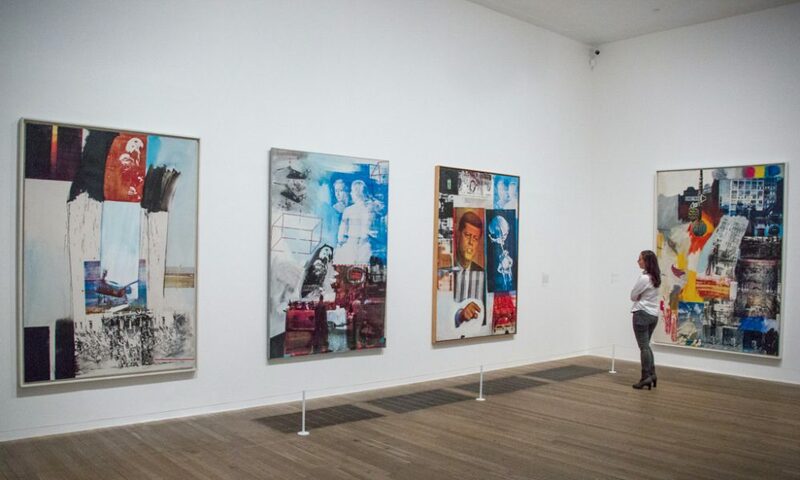 Robert Rauschenberg is on at the Tate Modern until April 2 2017. You can find further information here.